Bringing them home for the holidays, tutorials that were posted this past year as guest posts on other sites. Reruns if you will, but in case you missed them they will be new to you! Hi everyone! 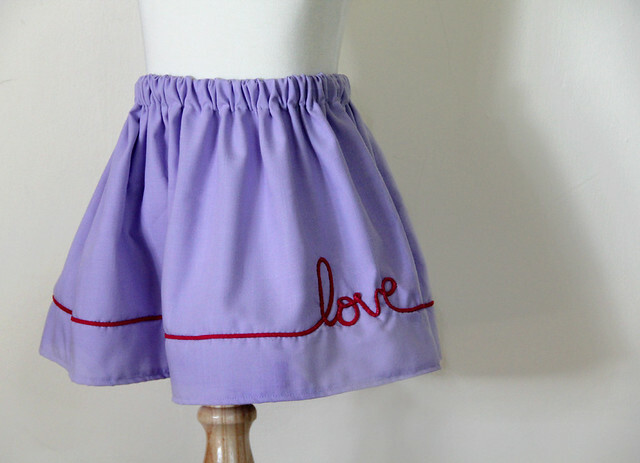 I am Jessica and I blog over at Me Sew Crazy. A Sewlebrity? Wow. I am honored, although I think Rachel may be seriously misinformed…ha! Recently I have been on a bit of a notions kick, a little bit more on the artsy side of things, which is when I had this idea for a theme pop into my head – ‘Love on the Line’. Inspired by the new Lucy’s Crab Shack Sweetwater fabric line for Moda, and her Ocean Trunks fabric. 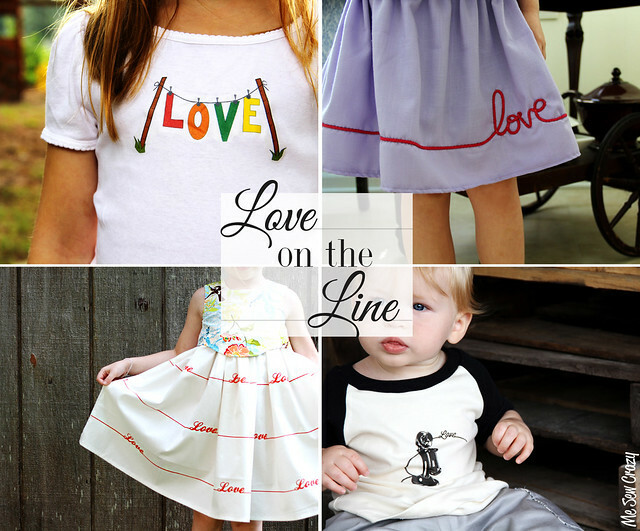 I saw that fabric and started thinking about how cute it would be to see little Love letters hanging from a wash line. Which led to how many other ways love could be on a line – both literal, and figurative. 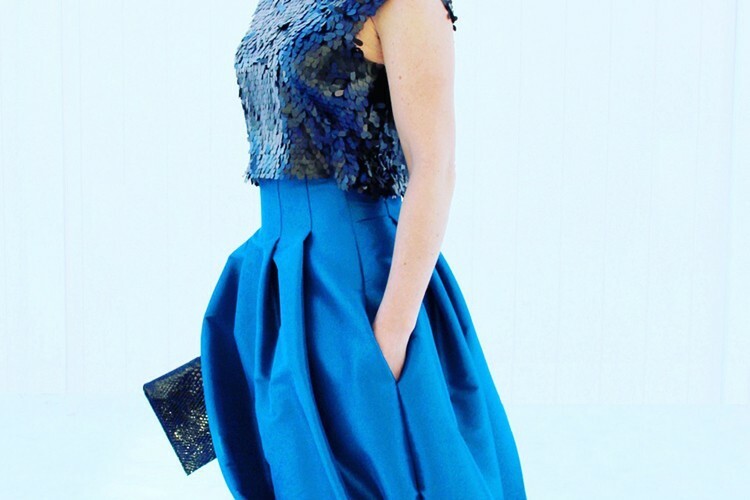 You can use any straight line notion you want for this embellishment, piping works great! I used a hot pink suede string I found a while back. 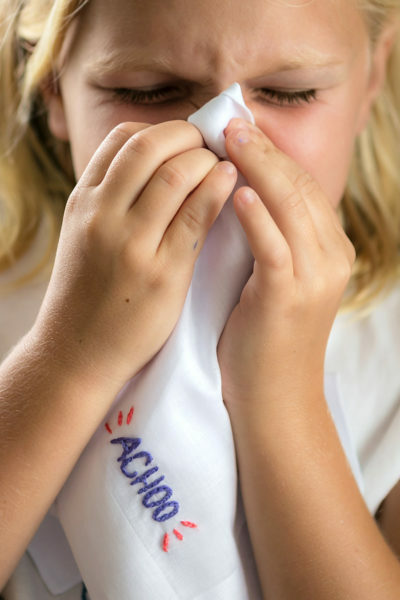 So long as it is machine washable, you are good to go! I used a fabric marker to do this, so any leftover markings would wash off! 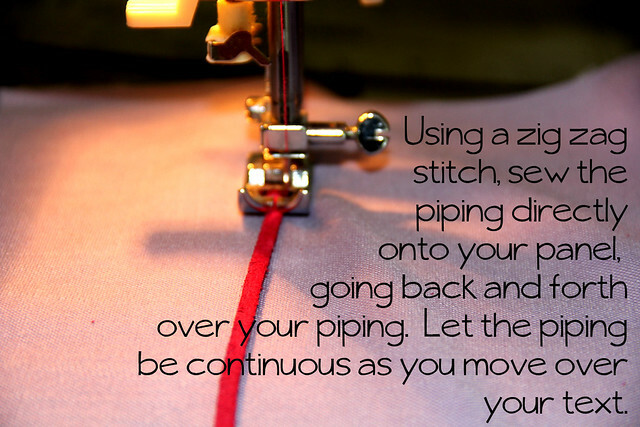 Use a zig zag stitch and simply go back and forth over the piping as you sew. 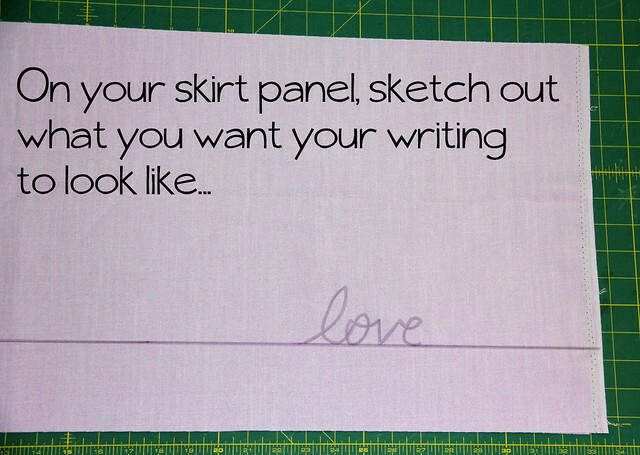 Wrap the piping around your text, sewing as you go. Be flexible with it! This method can work for other words, even to personalize your gift with a name! 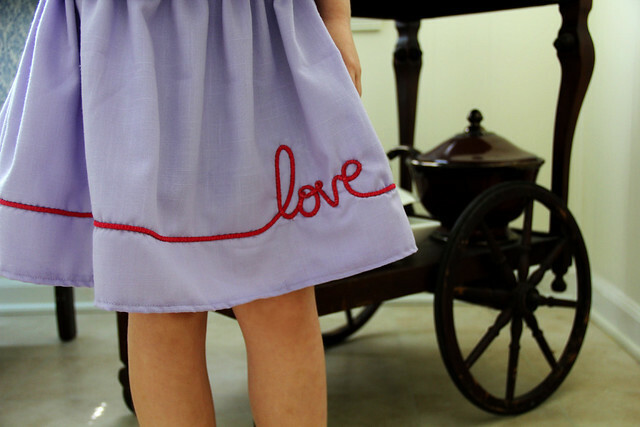 Simply by making the piping start and stop at a hemline, you won’t have to worry about the outside piping from showing. 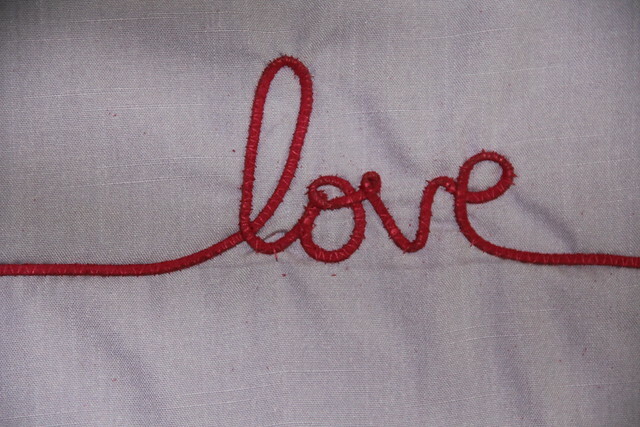 Once you are done adding your cursive embellishment, you can continue to sew together as instructed. I made a simple gathered skirt, which you can find a million tutorials for by simply googling it. But with this added touch, it turns it into something special. 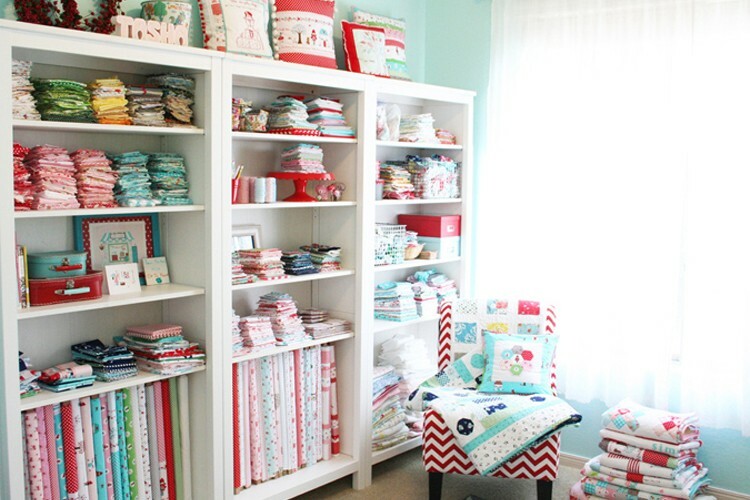 Imagine the possibilities – baby blankets, shirts, pillows…you get the idea! Thank you so much for having me Rachel. And to all of you Family Ever After readers, I do hope you will stop by and say hi sometime! 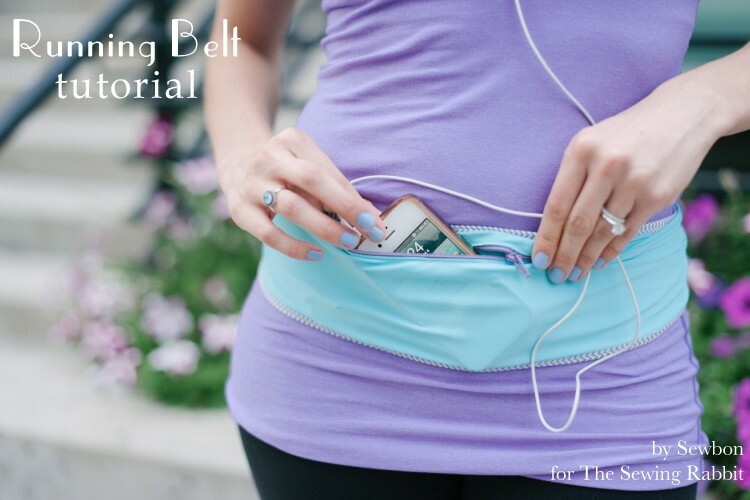 And be sure to check out my latest endeavor, SewSet! SewSet is an on-line sewing directory where you can see and search for on-line sewing patterns and tutorials, and upload your own to become a part of the directory! It is amazing how one blogger’s idea lead another for someone else isn’t it? I am constantly being inspired by brilliant bloggers like you! “Love on a Line”. Clever theme 🙂 I keep telling myself I can’t create and sew hap-hazardly. A theme is what I need to start this new year with! I just “LOVE” this idea! You are so wonderful! I think I would use soutache braid instead? Thank you for sharing your wonderful sewing skills, creativity, etc, etc, etc! 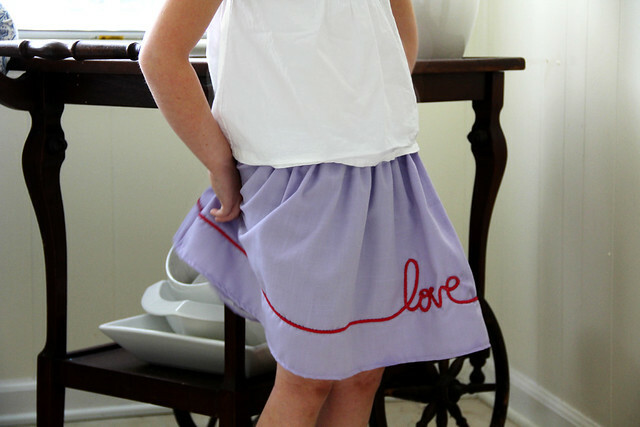 Oh and I meant to ask about the little white skirted “Love” dress in the picture above. Is that fabric printed by hand or did the sewer find it at a store? Wasn’t sure if that was one of yours? Any information on it would be helpful! Thank you.